Classic Slots is an instant win online scratch card game. It is not a slot machine, but a slot themed scratch ticket. 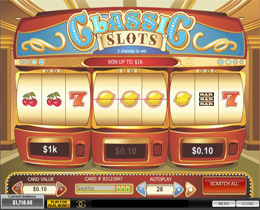 It consists of three classic slot machines with the familiar icons such as 7’s, different fruits, bar and bell symbols. To begin playing, first select a card value ranging from $0.50 to $10 and then hit the “Play” button. Once you have your scratch card you can take your coin and click on one of the three slot machines. Three icons will be uncovered and the winning amount will automatically be scratched open. If you have three of the same icons you will win the prize that is listed below the slot machine. A line will be displayed across the screen and the game will play a sound effect when you get a winning combination. You will have three chances to win or alternatively you can use the “Scratch All” button to save yourself some time. Prizes on the Classic Slots scratch card range from 1x, 2x, 4x, 10x, 20x, 50x, 100x, 200x and 1000x the value of your card. You could win up to $10,000 depending on your card value. You may use the “Auto play” mode and play up to 99 auto play scratch cards. You may type in your desired number of games you would like to play, or simply use the “+” or “-“. Players, who enjoy both the scratch cards and slot machines, will definitely enjoy the Classic Slots Scratch Card game. It is easy to play and the games move fast.